ANA takes 20% of Skymark Airlines. A loss of independence, or irrelevant as focus shifts to LCCs? All Nippon Airways (ANA) is urgently looking for overseas growth and international recognition, even seeking to boost awareness with a Star Wars R2-D2 liveried aircraft. But ANA is still relying on its domestic past as a foundation for long term growth, breaking from its international strategy to take a much anticipated 19.9% stake in ailing low cost domestic operator Skymark Airlines. This is ANA's second strategic reversal after it became the largest shareholder in Starflyer, another all-domestic airline. With an investment of only around USD30 million, the deal was seemingly too good for cash-rich ANA to refuse – but it comes with much baggage. Crucially, the deal has been announced without any word on how long ANA can remain a shareholder in Skymark, Japan's third-largest carrier but biggest independent airline. Tokyo does not want aviation reduced to an effective ANA/JAL duopoly, but its own regulatory policy failures – and reluctance to let foreigners in – leave few choices. However long ANA has, it must incorporate Skymark into its increasingly complicated brand matrix. Skymark will become the seventh airline brand affiliated with the ANA group. Even optimistically, the synergies and opportunities appear limited and risk distracting ANA from sorting out the messy strategy of its LCCs, which are to be Japan's aviation growth engine, especially internationally. Skymark risks irrelevance as ANA seeks to evolve and understand its place in global aviation. ANA Holdings and Skymark on 23-Apr-2015 announced an MoU under which ANA would partake in the "civil rehabilitation" of bankrupt Skymark Airlines. ANA and Integral, a private equity Japanese firm, will be joint sponsors. The selection of ANA was reportedly over numerous other companies, non-airlines and airlines (including AirAsia). A statement says: "ANAHD has experience with the rehabilitation of other Japanese airlines and has offered a wide range of support in sales, supplies and maintenance services to improve the value of Skymark’s business." Skymark is planned to receive new investment (for the payment of debts) amounting to JPY18 billion (USD150 million) with capital contributions of 50.1% from Integral, a maximum of 19.9% from ANA and other unspecified parties providing the balance. Voting rights will be in proportion to capital. Tokyo however is hesitant to let Skymark go into ANA's hands indefinitely. Although ANA has been permitted holding long-term investments in smaller carriers, none are as prominent or as large as Skymark, which was to be "the third force" or "third arrow" to challenge ANA and JAL and prevent the market from being an effective duopoly, before Skymark fell from grace in 2014. Skymark has brought much competition, especially in recent years. It is expected Skymark will be re-listed in five years (Skymark shares were de-listed from the Tokyo Stock Exchange on 01-Mar-2015). More immediately, Skymark could be re-branded, with "SkyBee" a reported contender. Skymark's board will have six directors, three appointed by Integral, one by ANA and the remaining two after discussion with ANA, Integral and other investors. More importantly, the parties expect one of Integral's appointments will be Skymark's chairman and one of ANA or other shareholders' appointments will be president, potentially giving ANA more influence than its equity stake may suggest. ANA's stake at under 20% means Skymark will not face the possibility of having its slots – particularly at Tokyo Haneda – re-assigned to other carriers. (In Japan, airlines do not own the slots.) A loss of slots would greatly diminish Skymark's value, which was anchored simply on possessing slots at constrained Haneda. Skymark's 504 weekly slots at the near-city airport equates to 36 daily slot pairs. Skymark is the third-largest holder of domestic slots at Haneda, with all other carriers affiliated with ANA or JAL (Starflyer and Air DO with ANA, Japan Transocean Air with JAL). Skymark: Too good to refuse or does the poor man pay twice? Much of the Japanese aviation community is focused on a simple ANA v JAL match. Viewed this way, ANA's stake in Skymark will see the ANA Group's share of Tokyo Haneda domestic slots increase from 55% to 62%, furthering ANA's lead over JAL. This, the argument goes, comes at a small price: ANA's 19.9% stake in Skymark corresponds to USD30 million – about what ANA could be expected to pay for a single narrowbody aircraft. ANA has 136 aircraft on order including 77 (large and expensive) 777/787 aircraft. This makes its investment in Skymark relatively inexpensive. 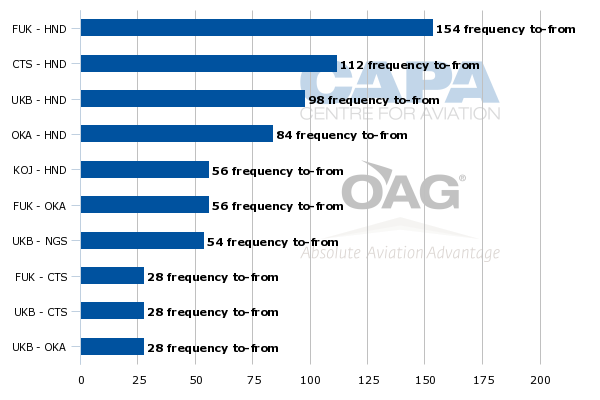 CAPA has previously advocated for some airline purchases on a similar basis – that they are small in cost with potential upside compared to purchasing aircraft, which can carry low returns. However, this equation is not quite so simple. As discussed in the following section, ANA in parallel with the Skymark stake is expected to take Skymark's former A330s. Lease and likely retrofit costs will exceed USD30 million, and the benefit from these aircraft is unclear. ANA will likely spend more on other Skymark-related matters than its actual cash investment in the airline. Then there are indirect, perhaps incalculable, costs involved in ANA's participation and strategic management. This may very well be at the expense of ANA's other, more pressing divisions, already becoming less coherent than is ideal. The implications of gaining Haneda slots do not tell a complete story either. ANA will not be able to re-direct the Haneda slots as it pleases. As seen with Starflyer, in which ANA also has a minority interest, network alignment is slow and small. Further, ANA will reportedly not codeshare on Skymark's routes from Haneda to Fukuoka and Sapporo. These two routes account for 53% of Skymark's Haneda slots. Fukuoka uses 154 weekly Haneda slots and Sapporo 112, a total of 266 compared to Skymark's 504 weekly Haneda slots. 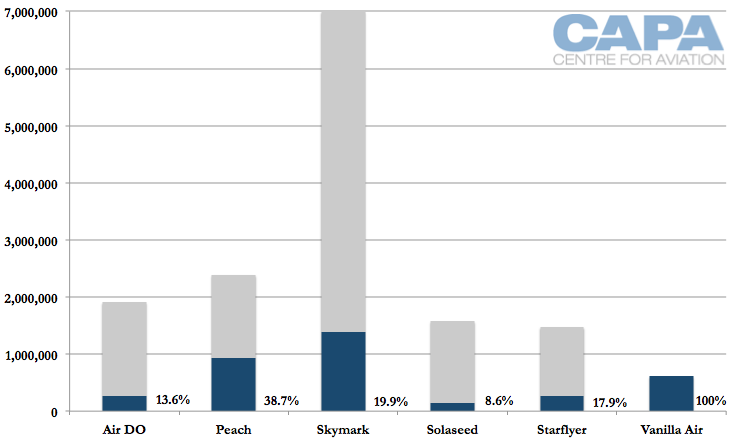 Whatever synergies ANA can extract, at the end of the day ANA owns only 19% of Skymark and will get a resulting fraction of any profits (or losses). Saying Skymark's slots are part of the ANA Group may be technically accurate but in practice not. A more accurate description of Skymark's slots would be that JAL has nothing to do with them – and perhaps that is what counts to many people in this old boys' club. It is inaccurate to label, as some media outlets have, ANA as providing a "lifeline" to Skymark. There were plenty of alternative sponsors, including foreign carriers. Japan has sporadically allowed foreign airline investment; all of its new LCCs at their origin had a foreign party involved. However, a domestic operation at prized Haneda was seemingly considered too close to home and too strategically important for a foreign party. In reality, this is a great excuse, and one bordering on xenophobia. An aggressive foreign airline would bring much needed efficiency to Japanese aviation. A regulatory and attitudinal legacy still prevails in Japan, creating higher costs, inefficiencies and a still less than transparent marketplace. Although Integral is said to have wanted a sponsor with aviation knowhow, there are other parties that could have delivered experience without the bias ANA will inherently bring. ANA has been involved in the rehabilitation of other Japanese carriers, which still stand but do not flourish. Such rehabilitated airlines have colloquially been branded "zombies". This calls into question the long-term usefulness of a major company – especially one with a very high cost base and a still-legacy culture – overseeing a smaller carrier. Reportedly, one of Skymark's creditors insisted the co-sponsor be an airline. This could have been a lessor; Intrepid owned seven of the 10 A330s Skymark had in service/on order and CIT the remaining three. Intrepid filed a claim against Skymark for USD900 million – more than Airbus' A380 claim. Intrepid and CIT have tried to re-lease Skymark's A330s but have had an exceptionally difficult time given the aircraft's unique all-premium economy configuration. Other operators would have had to re-configure the aircraft, which they deemed too costly. One obvious solution would be for ANA to take over the A330s. For now ANA has stated there is nothing it can announce at this moment. ANA would almost certainly re-configure the A330s and could potentially place the A330s with its LCC units. Likely markets would be beach destinations but also potentially Southeast Asian markets. This leaves unaccounted Skymark's cancelled order for six A380s, two of which have been built. Airbus is reportedly seeking a USD710 million fee for the cancellation. 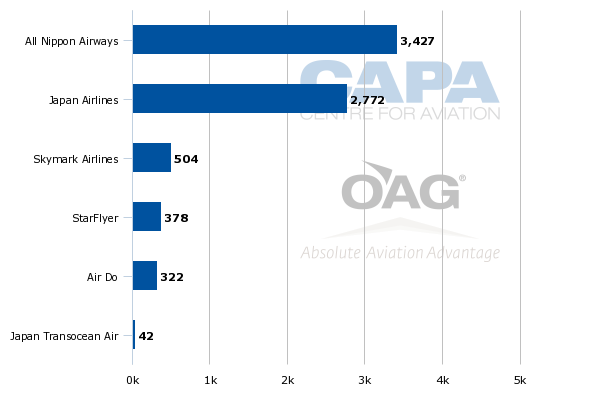 The A380s have been pinpointed as leading to Skymark's downfall, but as CAPA has previously elaborated, the scenario was more complex than that. The A380 order was grandiose and added to costs, but at the same time Skymark's core business was suffering from rapid over-expansion, partially caused by the introduction of the A330s. Skymark will become the seventh airline brand in the ANA "Group"
The addition of Skymark brings the ANA Group's main brands to seven: flagship ANA mainline, all-domestic carriers Starflyer/Solaseed/Air DO, international/domestic LCCs Vanilla Air and Peach and now Skymark. This is not a well-segmented business. Vanilla Air and Peach are redundant, especially now with Peach starting flights on Vanilla's Tokyo Narita network. Peach is also due to commence international flying from Tokyo Haneda, a large opportunity – and beating Skymark to the punch. Skymark only operates domestically. Skymark will overlap with ANA but also with Air Do and Starflyer: Fukuoka is Skymark's largest route and is the second-largest for Starflyer. Sapporo is Skymark's second-largest route but the largest for Air Do. And Skymark and Solaseed will overlap on the Tokyo Haneda-Kagoshima route. Where ANA has invested in ailing carriers (Air DO, Solaseed and Starflyer) its stake has been kept below 20% to ensure the carriers do not lose Haneda slots. 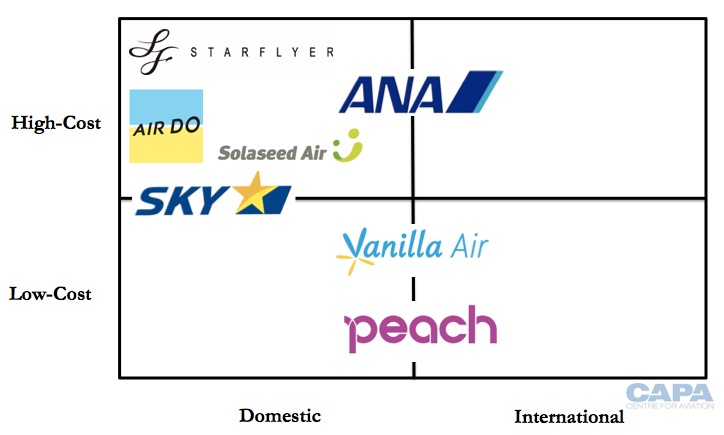 Skymark will be ANA's biggest investment of an ailing carrier; Peach and Vanilla Air have higher ownership but have a different genesis and no Haneda slots at stake. Skymark becomes ANA's largest investment based on domestic passenger traffic. Skymark carried million passengers in calendar 2014, more than double Peach's 2.4 million passengers. With Skymark, ANA finds itself possessing a gorilla. Skymark is not a small airline that can easily be pushed around. Skymark was reportedly reluctant to accept ANA's sponsorship, but the government (which supports ANA) favoured it and a mediator brought the parties together. In the brand matrix above, we place Skymark on the border of high-cost and low-cost. Before ANA can decide what it can do with Skymark, ANA and Skymark need to decide where the airline's future lies. As CAPA has previously described, Skymark became stuck in the middle, lacking a low cost base to stimulate traffic the way LCCs do, but also lacking a premium strategy to better pursue ANA and JAL's markets. Skymark must transform itself, but a more competitive airline would bring Skymark into greater conflict with the various ANA brands. Going further low cost would mean ANA operating three LCCs, while going up-market could see Skymark win accounts away from ANA. There are bold strategic moves to be made and carry huge ramifications – particularly if Tokyo mandates ANA's investments be short-term. ANA potentially risks empowering a future competitor. ANA has said it will codeshare on Skymark routes except for Haneda to Fukuoka and Sapporo. Codesharing should boost Skymark load factors and yields but also could lead to an unacceptable dominance prompting objection from regulators. ANA's Skymark acquisition is deemed acceptable by some since it will increase ANA's exposure in the domestic market, although as noted earlier this is questionable given a minority ownership and the majority of Skymark's slots not seeing direct (codeshare) cooperation with ANA. However, Skymark is the not the only means for ANA to increase its domestic performance. ANA's biggest opportunity lies within: its Feb-2015 domestic load factor was 64%. ANA's largest route, Haneda-Sapporo, performed above average with a 75% load factor. ANA's second largest route, Haneda-Fukuoka, had a 68% load factor, and third largest Haneda-Itami had a 66% load factor. Bringing Haneda-Fukuoka from a 68% load factor to an 80% load factor in Feb-2015 would have entailed carrying about an extra 44,000 passengers. That is about half of what Skymark could be expected to uplift on the route. While it might be argued ANA could use Skymark's capacity at peak hours, it must also be questioned whether that peak hour capacity is worth the off-peak capacity – plus all the costs and baggage of investing in Skymark. Market share comparisons are scarcely relevant when there is a waste of existing capacity. ANA being bigger than JAL based on slots means little when JAL could, if it wanted, drive up load factors and be bigger than ANA on passenger volume. The ANA-Skymark deal is not comparable to IAG's acquisition of bmi where all parties were more or less utilising capacity and there were not alternative growth options. ANA's stake in Skymark ironically recalls ANA's decision to partner with AirAsia and establish AirAsia Japan. In that arrangement, ANA intervened and partnered with AirAsia when it became apparent AirAsia and Skymark were about to establish the LCC. ANA invested solely to prevent a competitor doing so; and with Skymark is once again seemingly investing with the fear that if it does not, someone else will. In the grand scheme of Japanese aviation, the Skymark deal could be seen to be a sideshow, an old boys' club squabble that does nothing for – and potentially delays development of – international markets. Growth in international visitors has become a key objective for Tokyo, looking to benefit from tourism revenues. Potential international impacts from the ANA-Skymark deal seem limited, despite this segment being where the growth is. At the same time, while international is expected to grow, domestic is expected to shrink. Japanese airlines will serve 23 international Asian cities in Jul-2015, according to OAG data. This includes five cities LCCs serve alongside full-service carriers. There are no international cities a Japanese LCC serves that a Japanese full-service carrier does not. However, this will likely change – possibly significantly – as Spring Airlines Japan commences international operations in 2015 to Chinese cities. Japanese LCCs are present in four of Japan's largest international Asian destinations and have gained significant market share. Japanese LCCs account for 34% of seats supplied by Japanese carriers in Taipei, the largest international Asian destination from Japan. Japanese LCCs account for 39% of Hong Kong seats (the third largest international Asian destination from Japan), and 25% from Seoul (fourth-largest). 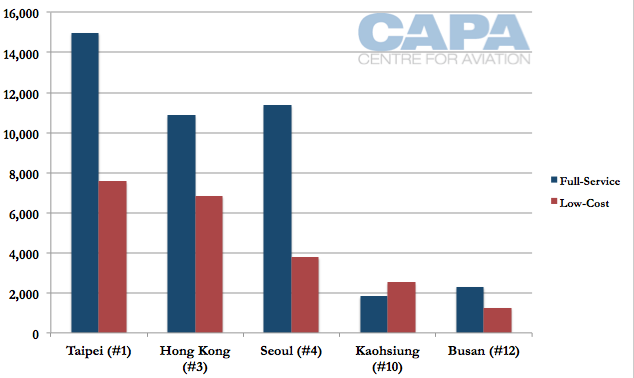 For now, it is only to Kaohsiung that LCCs have more capacity than their Japanese full service counterparts. The LCC volume and market share is impressive considering this new wave of LCCs barely existed three years ago. There is much development still to come, but the ANA-Skymark deal seems unlikely to contribute to it. At worst, ANA may divert management resources into a dying domestic market rather than a growing international segment. A week prior to ANA's 22-Apr-2015 confirmation it would invest in Skymark, ANA announced a 787 would wear a special Star Wars livery featuring the character R2-D2. At the time, ANA said: "Although it's a lofty goal, we hope that like Star Wars, ANA will become well known and loved across all borders and generations...many people associate R2-D2 with competent and reliable service – also hallmarks of ANA's 5-star service." The 787 will fittingly be used on international routes. Domestically, ANA will be challenged at a group level to achieve R2-D2's competence and reliability. Peach has moved onto Vanilla's turf at Tokyo Narita and will go international from Tokyo Haneda before Skymark. Skymark risks overlap with ANA's other domestic units, which will play second-fiddle as ANA works on its larger Skymark project. ANA's group matrix was complicated even before Skymark; its addition will require further management bandwidth without a major (if any) contribution to international development. Any domestic gains ANA will make could be alternatively achieved simply by improving its own domestic load factors. Claims about Haneda market share are fundamentally irrelevant when load factors are so poor; there is ample growth with existing under-utilised capacity. ANA might argue that its (often remarkably) high yields offset this inefficiency, resulting in good margins; but that differential is only sustainable while market inadequacies exist, and those quirks are progressively being ironed out. Any perceived weakness in ANA's international focus will be pursued by competitors that have a goal and will act towards it. ANA, however, has an international goal but with disparate and seemingly uncoordinated actions. This is a time for ANA to focus more actively on its core objective rather than increase its internal complexity, with only limited upside. The Skymark deal follows ANA's cancelled investment in a Myanmar airline and its lengthy examination but rejection of other prospective Southeast Asian airlines. ANA's latest ambition is to fly to every inhabited continent. ANA should look at what will make its business better, and not what will merely be another bragging right over JAL, with questionable commercial foundation. ANA to re-launch AirAsia Japan with new brand, oversight – can ANA get it right this time around? For Skymark: is it too little, too late? Skymark risks becoming a casualty in this new scenario, but this is due to its own reckless behaviour. The best it can hope for is a Tokyo mandate limiting ANA's investment. But even if Skymark learns as much as it can and, once it shakes off ANA, resumes its role as an independent challenger, there still may be limits on Skymark's growth potential. Skymark did not demonstrate a cost base that could stimulate growth and stand up to comparison with the new LCCs. Restructuring provides a fresh opportunity to focus on costs, costs and more costs. But with four and soon to be five LCCs with competitive cost bases, Skymark's changes may be too little too late. Skymark will strive to avoid joining Japan's other "zombie" airlines in neither dying nor flourishing, instead merely surviving on their precious pool of Tokyo Haneda slots. It is an outcome perhaps acceptable to Japan's old world aviation club, but much to the detriment of consumers. And one that is clearly not sustainable as Japan inevitably opens its skies more to the variety of foreign airline interests.